flame are very rare and extremely valuable. Rubies that are beautiful in their original crystal form are extremely rare. To satisfy the demand for beautiful rubies, crystals have long been heat-treated to remove blackish or bluish colors and bring out their beauty. Recent advances in heat-treatment technology have dramatically increased supply, making affordable prices a reality. However, the high-temperature treatment (1,600 -1,900 C /2,910 -3,450 F) of rubies has resulted in diminished durability, giving rise to problems such as a loss of consumer confidence in the material. Rubies from the historical Mogok district, and from the Mong Hsu mines that began production in the late 1980s, are representative of the material from Myanmar. Rough stones from these areas are taken to Thailand for heat treatment and subsequent polishing. However, not all of these rubies are heated. Gems that are inherently beautiful, with few defects, do not require treatment. The ruby as shown in the photograph on the next page is an untreated ruby from Mogok. It is a superb piece with high transparency and brilliance, weighing 5.46 carats. At a tone level of 6, it displays a well-balanced mosaic pattern and a red, flame-like color. 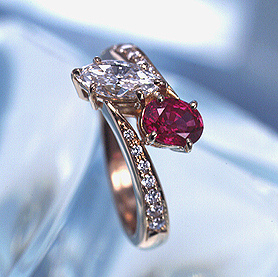 Small rubies weighing less than 0.1 carat often appear to lose their brightness at tone level 6. This is because each point in the mosaic pattern becomes so small that the contrast between them is lost. Any small stone, not just ruby, will generally be better suited for jewelry use if its color is slightly lighter in tone. Professional jewelers know from experience that ideal tone levels change with the size of a stone. Evaluation of the color tone also differs between generations, nationalities, and how the gems are used. Rubies with a tone level of 4 and beauty grade of S or A will have superior beauty, regardless of size, so it is likely that such stones will become increasingly popular, with their values rising compared to other stones. Untreated rubies from Mogok are often quite included, but as long as the inclusions are not excessive, they can give a stone a soft beauty. Inclusions are permissible as long as they do not detract from beauty or durability. A well-balanced mosaic pattern of light and dark shades of red is a prerequisite for beauty grades S and A.